(207) 942-3000 | Need Directions? Home › Blog › Gingivitis: Are Your Gums Trying to Tell You Something? 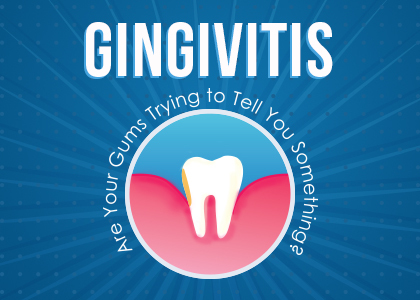 Gingivitis: Are Your Gums Trying to Tell You Something? Gingivitis, very simply, is an inflammation of your gums. (Any time a medical term ends with “itis” it means inflammation.) Gingivitis varies in severity and can look a few different ways. Very bad gingivitis leads to periodontal (gum) disease. Gingivitis is common and affects many, rather, most adults. But with good oral hygiene and the care of a professional Bangor dentist, you should be able to avoid any major problems and even prevent gingivitis before it begins! Dr. Sevey and Dr. Sigwart talk more below about what causes gingivitis, how to prevent it, and how to treat it if it happens to you! Plaque forms on your teeth and near your gums after you eat and drink. Regular brushing and flossing cleans your teeth and removes this plaque. But if you go too long without brushing and flossing, or you don’t do it well enough, the plaque can build up and harden in your mouth. At this point, the plaque becomes tartar that can only be removed by a dental professional. Tartar builds up on the line where your teeth and gums meet, it sticks and hardens to your soft gum tissue. Tartar irritates your gums and makes them more sensitive to oral bacteria that normally aren’t a problem. Your gums inflame in order to fight the bacteria and tartar. Inflammation causes gums to bleed easily during brushing and flossing. In most cases, gingivitis just means slightly swollen and sore gums. If this happens, call your dentist and definitely keep brushing and flossing your teeth. Try brushing lightly and using a soft toothbrush if your mouth is very sensitive. As always, brushing your teeth for two minutes twice a day is the best way to care for your teeth and gums. Flossing or cleaning between your teeth once a day is also very important. Make sure you curve the floss in a C-shape, around the tooth, and under the gumline. Next, be sure to get regular dental care from our team at Creative Dental Solutions—about two visits per year is recommended. If you have gingivitis or gum disease, Dr. Sevey and Dr. Sigwart will help remove tartar, control the infection, and might advise you to change some personal hygiene habits. More advanced cases of gum disease may require more extensive treatment methods. If you’re looking for a Bangor dentist to help you feel your best, Dr. Sevey and Dr. Sigwart are taking new patients. Contact us to make an appointment at Creative Dental Solutions today! Dr. Sevey has 30 years of experience in the dental profession. Dentistry is constantly evolving and Dr. Sevey’s commitment to continuing education keeps him current with the latest advances in order to benefit his patients.